Segmentation is a process of dividing your email list into smaller groups based on certain criteria. Think of it as grouping people based on similarities or differences. I know I have. And I’m sure you are thinking of a company or someone in your head right now. Others try to avoid this by dropping the honorifics or getting straight to the point. While that’s ok, it still doesn’t solve the main issue — the lack of relevant content. A lot of Filipinos simply accept the fact that they can get bombarded with unsolicited emails, SMS, and other form of harassments. Sadly, we don’t have laws in the Philippines such as the CAN-SPAM act or the GDPR that can resolve this. But that shouldn’t be the case. Even if there are no “laws” governing how these things go, professional marketers ought not to be doing these harassments. Marketing today is all about helping the buyer get all the information they need so they make a decision to purchase (or not). The underlying principle is to be helpful. And the easiest way to do that is through segmentation. There are two primary objectives of segmentation. First, you create these segments so that you can send the people in these segments relevant content. For example, if you’re an organization that sells clothes. Would your entire email list be receptive on an email campaign about blouses? I don’t think so. It’s the women in your list that would be interested. And the men? They’ll be annoyed. Some might even unsubscribe. Or worse, report your campaign as spam. Segmentation helps you avoid this problem. It gives you a chance to create personalized and relevant content. Just take a look at this eCommerce shop who didn’t bother segmenting their list — nor tried to get to know me. Take a look at the dates and the subject lines. 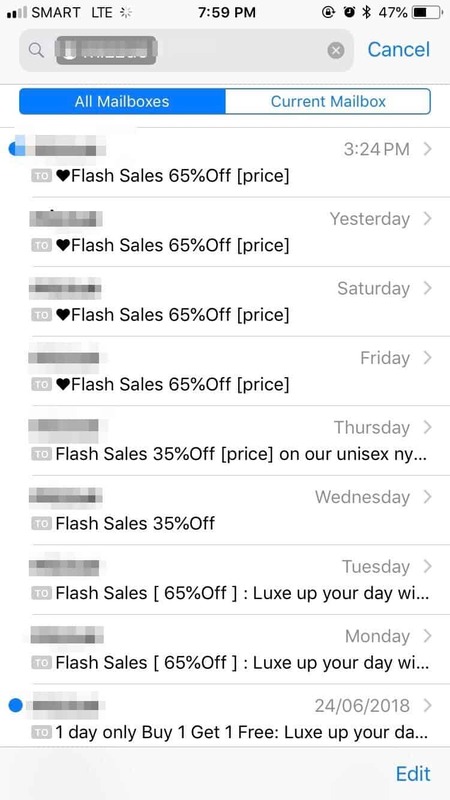 Every day, this eCommerce shop offers a sale/discount. Sometimes, they send an email twice and it’s still about a promo. The next objective of segmentation is to give you data that you can analyze later on to gain insights on your audience. The earlier you start collecting data, the better your analysis will be. People who answer my forms are divided into these segments. For example, if I found out that 50% of my list are business owners (owns the business), I might create something special just for them. The same holds true for other segments. You can use this to make effective decisions. You know the best part of this? You can create your own business reports that you can turn into a marketing offer. Ever wonder how international organizations come up with “State of the ____ Reports” yearly? They all start with data collection and segmentation. Then, they analyze the data they need, ask more questions if needed, visualize the data into charts, add some copy to explain them. Finally, they organize and compile this into a PDF. They then use this as a marketing offer to generate more leads. They get to ask more questions, collect more data, and get better insights. Then they repeat the entire cycle again. You can apply this to your organization as well starting today. Every organization is different. There is no set list of segments that will fit for everybody. Some are necessary while some doesn’t make sense. What matters is you start collecting now.